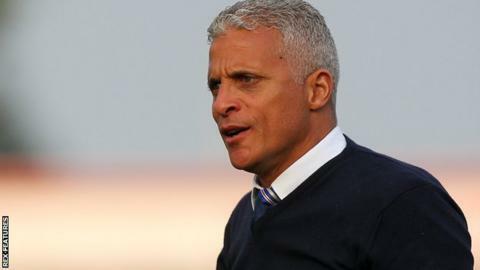 Manager Keith Curle says progress has been made on his longer-term future at Carlisle United, with emphasis placed on a shared ambition for success. Curle, 51, joined the Cumbrians in September 2014, signing an initial deal until the end of the current season. Having led the club to within a place of the play-offs so far this term, new contract discussions were held. "It's about me matching the club's ambition and the club matching mine," Curle told BBC Radio Cumbria. "It's not about money, it's about a need to be successful. "I have an ambition and need to be successful and I need a club that shares that ambition. "It's not all about spending money- it's about investing in the right people, staff and players who can get us success." The former Notts County boss helped the Cumbrians survive relegation from the Football League last term, and has reshaped the squad since. Away from the league, FA Cup second-round progress was secured with victory against Plymouth on Saturday, having previously taken Premier League side Liverpool to penalties in the League Cup earlier in the season. "I had a conversation with the chairman and John [Nixon, managing director] and we got to a position where things were put down on paper as an official document to say these are our guidelines and parameters," he added. "It will get picked up in the week, when I get to speak to the chairman."